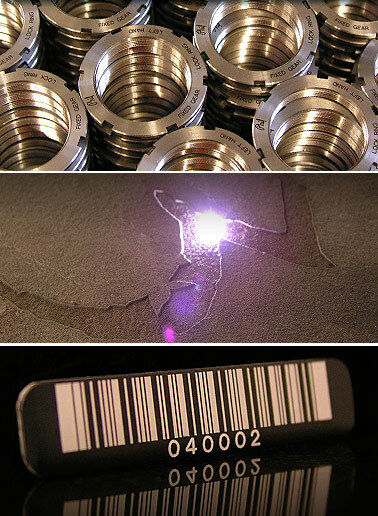 Laser Impressions Inc. is the largest and most experienced laser engraving job shop in the Western United States. Established in Northern California’s Bay Area in 1980, Laser Impressions pioneered the serialization of silicon wafers for the semiconductor industry. Following that breakthrough we expanded into medical, industrial and aerospace laser engraving in 1984. Laser Impressions operates 13 Nd:Yag and C02 laser engravers that are fully tooled to handle cylindrical parts as small as 0.001 inch in diameter to flat sheets up to 4′ x 4′. Our laser marking and engraving services are streamlined to handle everything from single prototype lots to large-volume production runs. This list demonstrates a small sampling of the materials we have successfully laser engraved. Stainless Steel, Titanium, Aluminum, Ceramics, Radel, Ultem, PEEK, Delrin, Thermoplastics, and many other Biomedical and Industrial Grade Materials. Our machines can also laser engrave on or through powder coated, painted, gold plated, nickel plated, chromed surfaces as well as many other types of plating. Thank you for visiting our site and learning about Laser Impressions. We’d love the opportunity to quote your next project. Please send us an email or call us at 800-344-LASER (5273).